There are a bunch of automatic hand sanitizer dispensers throughout the buildings at work. The manufacturer clearly likes the idea of selling lots of refills for these machines because they shoot our about a quarter cup of goo at a time. Apparently they were calibrated on a different planet where everyone has eight hands. We have the opposite problem with the sanitizer dispensers that are placed in all of the UNH buildings… you have to pump them easily 3 or 4 times before you have enough for both hands. I was going to ask how he got paper cuts on the backs of his hands, but I decided the answer would probably be beyond the understanding of us mere mortals. Heh, they’ve got that at work too. We just take the back out of the containers and pour as needed. Then again, we’ve got actual soap in the bathrooms, so that’s where I do my hand cleansing. 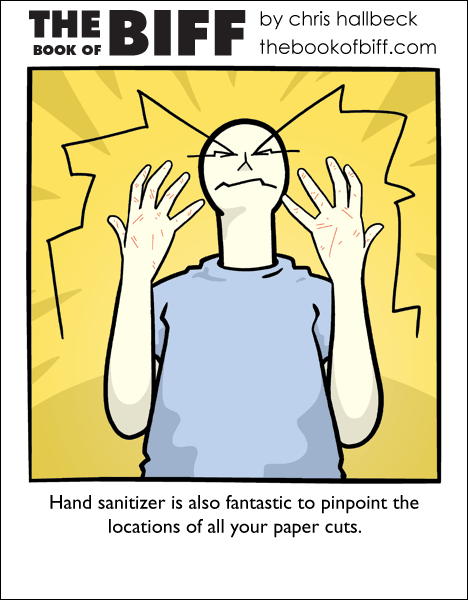 I’m not a huge fan of sanitizer due to the fact that it’s not really helpful as it is making germs immune to it. Good old animal fats to wash away the ickies! This technique also helps you find your eyes. Oooh, I feel Biff’s pain. Mophtran: soap has no appreciable effect on surface flora on the skin – and there’s no real possibility of resistance to alcohol hand sanitizers. Man, I wish I didn’t know how true this is. He was probably thinking about antibacterial soap, which kills necessary, protective natural flora as much as the bad guys. But hand sanitizer is overly drying, so plain soap is still best if you have a sink. Bar soap is crap, though. I fold a ton of pizza boxes in my spare time at the supermarket I work at, and end up with lots of them on the backs of my hands…and none on the palms. As for this comic, ow, ow, OW! I winced automatically reading this. I use the Purell Foam at my workstation, and that stuff causes my hands to crack and bleed because it saps away moisture from the skin, so I have to be extremely careful on how I use it. There is a sink three steps behind me, so I use that most of the time and save the purell for carefully-applied touchups. Try doing like a quarter pump. That is what I had to do back at my summer job. Also: this comic and this comic would both make excellent desktop backgrounds if the background around the comic was extended (along with probably getting more of the lower portion of Biff) Windows 7 allows me to have however the hell many Desktop backgrounds I want, and I need more Biff ones! During Godpell about half the cast came down with some form of sickness, including one of my good friends who had penumoia(sp) and missed all of the shows but 3. We had hand sanitizers on EVERY stage door and in the greenroom and people were using it by the truckload. Not to mention helping to add that lovely rubbing alcohol flavor to any finger food you might be eating. I like when Biff is in pain. He looks so cute. I worked in a movie theatre for several summers. The one thing better than hand sanitizer at identifying papercuts is popcorn. Spend an afternoon elbow deep in that stuff – the kernel shards will ensure you get lots of little scratches, and the salt/oil content will ensure you notice. The agony of sanitizing…would that be sanity? Lol… Nice one… I know that feeling all too well. Question for ya, Chris, what exactly do you DO for a living? @baughbe – That’s why I always use something to open the door like a paper towel or a wad of TP. Most bathrooms have the waste container next to the door. If not, I try my best to keep the door open with my foot so I can reach for a toss. If nothing else I’ll just throw it on the floor as close to the trash as I can get. It’s their fault for not putting a trash barrel near the door! I discover cuts I never even knew about with the power of hand sanitizer. I work at a theater and they have a bottle velcroed to the podium. I actually like it when customers use it, but it’s velcroed down to prevent it from being stolen. Like that would stop someone who wanted it. we’ve had pictures stolen off the walls before. Now if they were only raccoon wounds, I’d be able to say this. AHHH! THEY’RE IN MY RACCOON WOUNDS! Hand sanitizer is an american feature? I dont know anybody who use it, and I’ve never seen a sanitizer dispenser. If there is a bathroom, I wash my hands with god ol’ soap and water. And I grab some tissue from an open toilet if there are no paper towels to open the door. There is usually an open top trash recpticle somewhere outside so i toss the tissue/paper towel in it. For road trips when eating is a must or gas station with a questionable bathroom (I’m not afraid of finding a tree, I promise you! ), hand sanitizer. Hey Chris, is there a small linking icon for Biff I can put on my website, once I’ve finished upgrading it? Biff i know your pain. I know your pain! so, 1 word= Ouch. I feel your pain. You want a papercut? Watch 1:42 into this video! I remember the day I went into surgery to remove an ovarian cyst. (Yes, I’m a girl) My father attempted to take a bath by using up the hand sanitizer from the unit installed in the wall.